We finally get to see how Telltale Games re-imagines Harleen Quinzel in episode two of Batman: The Enemy Within. The ultra-popular character is planning plunder on an epic scale with a gang of vicious supervillains. Oh, and the guy who we all know is going to be the Joker is deep in a major crush on her. The latest installment of this year’s episodic Bat-game starts with a bold robbery by the crew of criminals mentioned by the Riddler before his sudden death in episode one. When Batman races to the scene to try and stop it, he gets smacked down hard by drug-enhanced strongman Bane. After the events of episode one, Commissioner Gordon and Amanda Waller are butting heads over who’s in charge of keeping Gotham safe. They both show up to help Batman recover and Waller tasks the Dark Knight with infiltrating the crew of bad guys looking to wreak havoc in the city. Depending player decisions made in during the first season and episode one, trust between Gordon and Batman can be fragile. 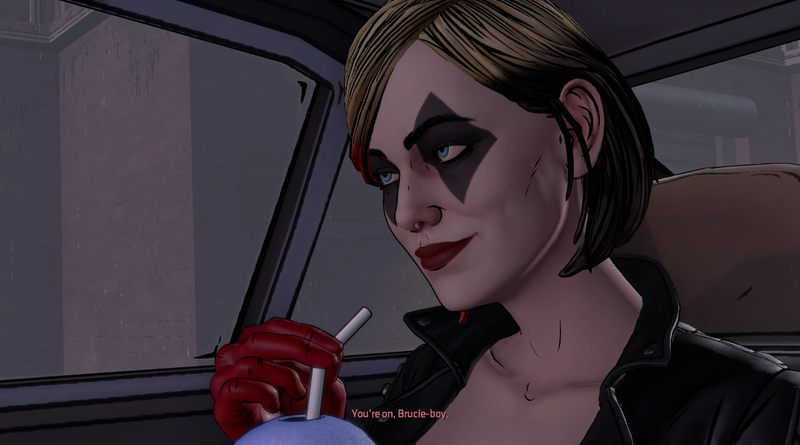 The choices presented in episode two threaten to drive a wedge between Bruce and other important characters, too, as he has to figure out how to get in good with Harley and her crew. The first meeting between Dr. Quinzel and the son of Thomas and Martha Wayne gets tense right away, especially when she points a gun at his head. In the conversation, that follows we see Harley exhibit a shrewd sort of doubt about Bruce’s cover story. It’s readily apparent how different the power dynamic is between Harley and the man who will be Joker. She bosses him around and talks about him as if he’s not an equal; he’s merely, a hench-lieutenant with potential. Furthermore, unlike the character who gets commands barked at her by the Joker in other iterations, The Enemy Within Harley almost never lets anyone tell her what to do, even Bane. As the episode progresses, Harley makes Bruce steal from important tech from Wayne Enterprises that they later use in a frantic convoy robbery. Her partners-in-crime are Mr. Freeze and Bane and they’re a lot more familiar than this Harley. Freeze gained cryogenic powers in a lab accident and cares only about his ailing wife. Bane, meanwhile, wants to be the alpha in all situations and talks trash to Bruce when they first meet. Episode two makes a point of showing that this version of Harley has insight into her own psychology. She’s aware of her behaviors and their consequences and is even capable of apologizing for something she’s done wrong. These traits aren’t necessarily a big deal for most well-adjusted adults, but they’re more remarkable when one considers that Harley has rarely been shown as anything close to well-adjusted. This Harley feels more calculating and canny, in control of her fate in a way that’s a huge break from the character’s early, formative appearances. She certainly doesn’t care about the possibility of John Doe getting jealous when she flirts with Bruce Wayne. The version of Harley Quinn folks saw in the Suicide Squad movie went running back to an abusive toxic relationship. The one we meet in episode two of Batman: The Enemy Within feels like she’d never do that, and that divergent unpredictability makes me even more interested where she—and this season of the playable Bat-drama—will go next.